Mike Carp suffered a strained shoulder diving for a ball in the outfield in the second game against the A’s in Tokyo. He had an MRI upon returning to Peoria that showed no structural damage. Optimistic estimates have him being ready for the home opener. Adam Moore has recovered from the broken bone in his wrist (and played 5 innings in a minor league game on Friday). He will travel to Tacoma when minor league camp breaks on Monday. Reports are that everyone is a bit bleary-eyed and it will take some time for all the body clocks to get adjusted (hence, no one who made the trip played in the game last night). 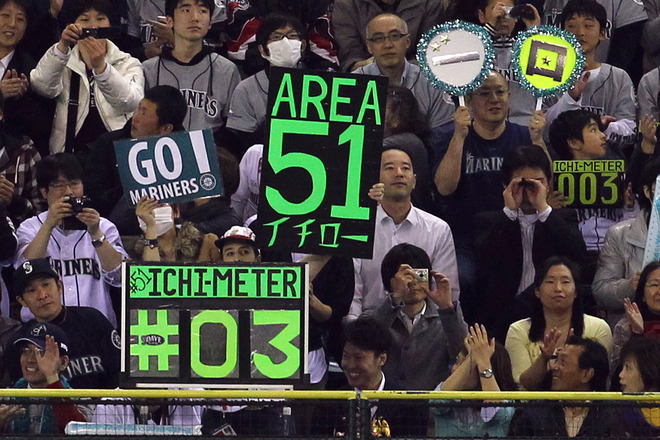 Logistically everything went off without a hitch – 145 made the trip on the Mariners charter and 147 returned (picked up a couple Japanese media to cover the M’s back at home). Ryan, 30, proposed to his long-time girlfriend on Tuesday on the Sky Deck on the 54th floor of Mori Tower, one of Tokyo’s tallest buildings, surprising her with a ring he’d brought from the United States as part of a master plan he managed to keep secret for months. Ryan told his girlfriend, Sharyn, that they were going on a tour and needed to get dressed up. 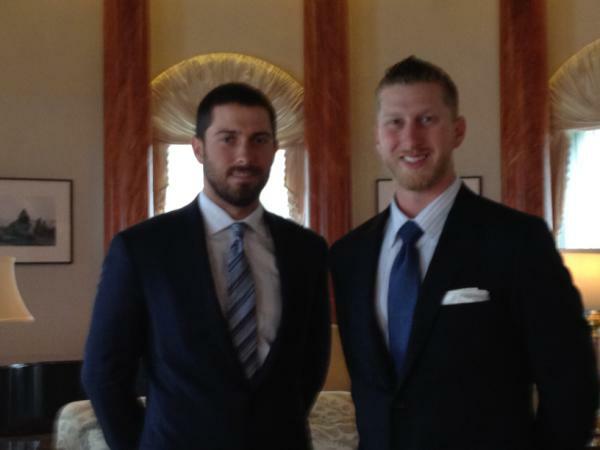 MLB provided a fake “tour guide” who took the couple to the tower, where Ryan waited for the perfect moment. The hyperactive Ryan thought of everything on this one, even realizing he shouldn’t trust himself to bring the engagement ring with him to Japan. which means ~ Felix for the home opener on Friday the 13th! Alex Liddi named Peoria Rookie of the Year! (Justin’s first of the season) and it was of the solo variety. A pattern seems to be forming (ok – only two doesn’t really make a pattern but, it’s hard to set aside last year’s experience) where a good to great starting pitching performance is not justly rewarded. Jason Vargas pitched 6+ and gave up two hits and two walks and one run (aboard via a walk that scored when Kelley gave up a homer in relief of Jason) at one point retiring 14 of 15 batters. Larry Stone tweeted that Sherrill faced 81 lefties last year and gave up ONE homer and this year gave up a homer to the first lefty he faced. It wasn’t exactly a steller night for the O either…. And, look at this – SEVEN walks – definitely should have scored more than ONE run. which, apparently, is how every MLB season opening series in Japan (this being the 4th) has ended up. for some jet-lag recuperation and last bit of tuning up before their “next” opener – in Oakland one week from Friday. after allowing a lead-off hit to Weeks (who seems to be as annoying to the M’s as a A as Figgy was as an Angel) he went on to retire 9 in-a-row before allowing 2 doubles in the 4th – Carp made a nice diving try for the second one (off Suzuki’s bat – another one of those pesky A’s) but, to no avail and the run scored to tie the game. Speaking of Carp, he was a pretty busy man, especially in the later innings when he recorded a total of 5 put-outs. Over the next 4 innings, it was a bit of a mixed bag for Felix – a couple HBP, a single, a double and a stolen base – but no runs, so he did his job. And, as per usual, a shame he didn’t get the win – thought he would be the first to say what matters is the TEAM win. but, the single he gave up was a bit breath-taking – in that it whizzed right between is glove and his face! But, he was none the worse for wear and a K later, he was shaking Miggy’s hand. And in the end, his most enjoyable moment came when teammates told him how much they apreciated the crowd here. Members of the A’s told him the same thing on the field the many times he reached base. Actually, it was something more than that to him. 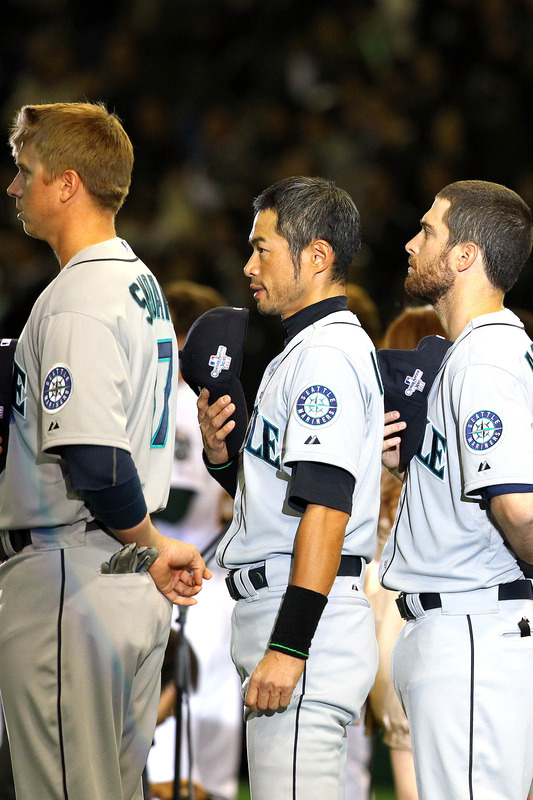 “To see the fans and how they react and how they welcomed the players, they’re very warm-hearted,” Ichiro said. four and a half hours till first pitch…. I really want to take a nap, so I will be all fresh and rested for every pitch, every at bat. Trouble is … I’m not tired! Not at the moment anyway. Hoping I’ll be able to doze for an hour or so at some point prior to first pitch. This one is worth re-posting – it’s such a great shot! Opening Day Japan just a few short hours away. Here we go 2012! Wishing all my teammates good health and best of luck this year. 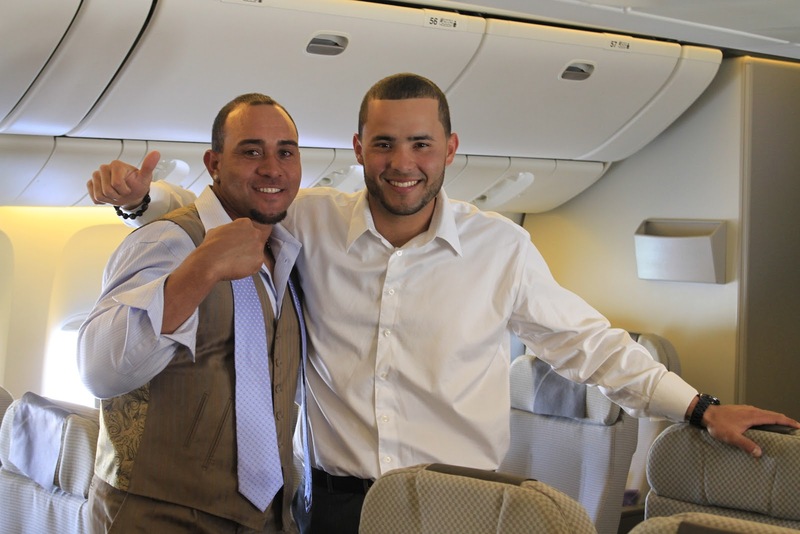 Ladies and gentlemen, we’re 12 hours away from the first pitch of the #OpeningSeries. How are you planning to watch the game? 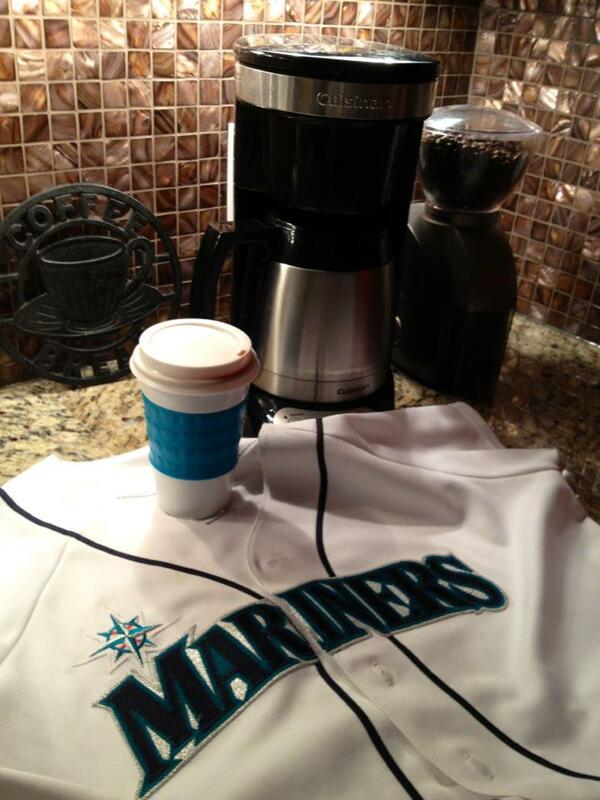 @Mariners I will try to nap around 11pm and have the alarm and coffee pot set for 2am. Can nap after the game too, since I took the day off! @CompassRosy A fan with a plan. We like it. I happened to wake up from a sound sleep to see that the M’s game had started just minutes before (at 3am PT) so I watched on my phone for a few minutes and drifted in and out of sleep. Ackley had already homered but that was countered by a Giants home in the bottom of the inning. 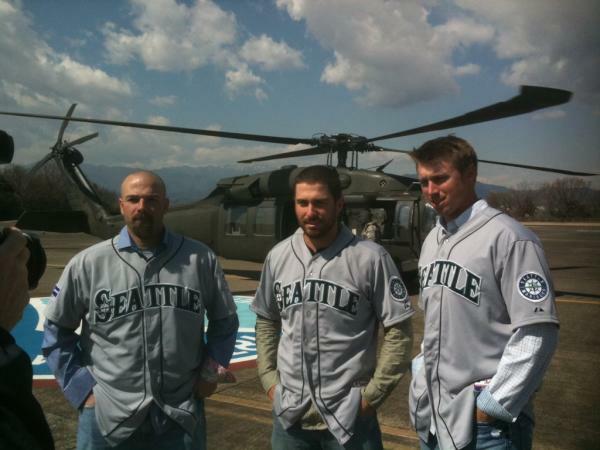 Ackley would later triple and Seager a double (for an RBI) and Ichiro had the other RBI. And that was all she wrote for the offense. And things did not get any better on the pitching side of the ledger. To say Iwakuma struggled would be an extreme understatement. Some, since, have enve speculated injury. And then there was the defense that shown initially with a nice DP as well as an outfield assist by Carp but later, 2 passed balls by Quiroz, a failed pick off by Sherrill and a throwing error by Liddi (all in the 6th inning!) erased all that. Let’s just say – they are glad this one doesn’t “count”. And, maybe the very raucous atmosphere, that even the vets, let alone the rooks, aren’t even used to. Here’s some great photos and pre-game video from Geoff Baker. giving up 3 runs on 4 hits (including a 2-run homer) a HBP and a walk. Then, he settled down and allowed only 2 hits over the next 3 innings.